Miss Moore Thought Otherwise by Jan Pinborough. Illustrated by Debby Atwell. Houghton Mifflin Books for Children, 2013. Currently available. Face Value: There’s a lot going on in this cover image. For me, there is one key element that stands out: the proportions of the people in the picture. Everyone is standing in front of the New York Public Library. The children are playing and reading and conversing in front of the steps, and Miss Moore towers above them all. I think the illustrator wants us to realize Miss Moore’s large presence and significance in the history of children’s libraries. From what I have read, it sounds like Miss Moore was an imposing personality who loomed large in the eyes of those who admired her. Does it break the slate? Absolutely. With very basic text, the author creates the historical context to help us understand the limited opportunities available to women in the time when Annie Moore lived. We get to read about how Annie Moore repeatedly forged new paths for women and children, and dedicated time to make sure that young people throughout the United States and the world had access to library resources. Who would we give it to? Do you know a very young person who has been assigned to read a biography for class? Ding ding ding! This is an awesome biography of a bold and smart woman who could inspire young readers. I also want to give a copy of this book to every children’s librarian I know. Review: Picture book biographies are a tough sell. They don’t exactly scream “fun read aloud material,” so it can be tough to find the appropriate venue in which to read these books. 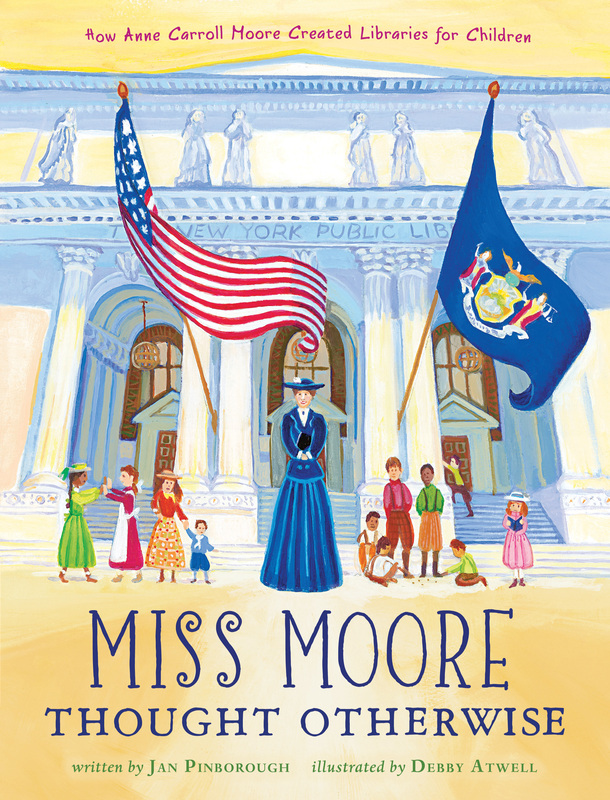 Miss Moore Thought Otherwise employs the literary conventions of those charming read-aloud books to tell the real story of a remarkable woman. With its beautiful illustrations and careful structure, this is a biography that is fun to read aloud. This book tells the life story of Anne Carroll Moore, the woman who is credited with creating libraries for children in the United States. Anne, aka Annie, had always been a woman who questioned the status quo. She grew up valuing books and education, and when the opportunity presented itself to become a librarian, she pursued it eagerly. Anne started her career at a time when libraries were rigid, unwelcoming spaces. Children were barely allowed to enter the library. They were certainly not permitted to take the books home to read. Miss Moore thought this was silly. How would children become engaged readers and learners if they weren’t even allowed in the library space? She designed a children’s library room for the New York Public Library that was unlike any library space seen before. It was welcoming, colorful, and meant to engage young eyes, ears, and hands. Moore’s ideas about children, reading, and learning caught on throughout the United States. Other libraries began to design collections, spaces, and events especially for child readers. I am grateful for Miss Moore’s ideas, because going to story hours at my public library was one of my favorite things when I was a kid. I still love perusing the children’s and YA sections of the public library – that’s where I get most of the books that I review on this blog! Without Miss Moore’s influence, none of that would be possible. Even with minimal text, Pinborough manages to bring Moore’s spirit to life. The repeated phrase “Miss Moore thought otherwise” appears throughout the book. Every time a limitation or obstacle is introduced, we read that “Miss Moore thought otherwise” and then we watch Annie tackle that challenge with figure. It’s a great literary convention for young readers to watch for throughout the book, and it has a rhythmic appeal that makes it fun to say out loud. It also emphasizes that Anne Carroll Moore was a true Slatebreaker, always pursuing what she believed rather than what others told her was appropriate. This entry was posted in Picture Books, Reviews and tagged children's library, librarians, libraries, New York Public Library, Picture Books. Bookmark the permalink.